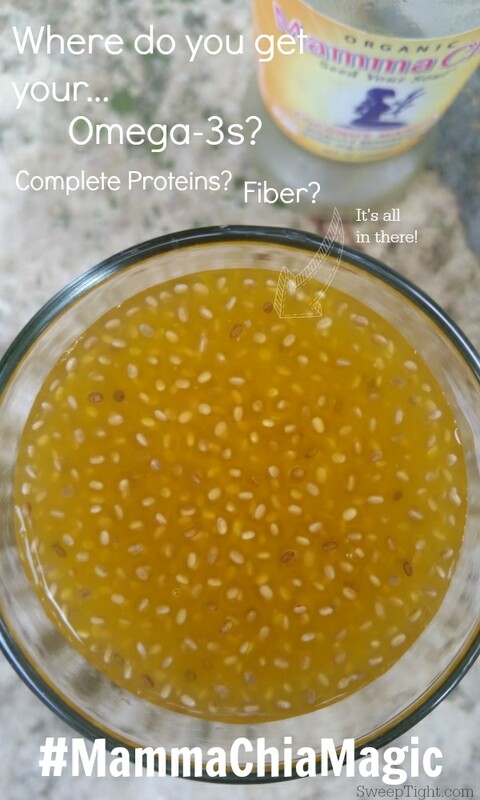 Just in time for back to school, I rediscovered my favorite brain food–chia! More specifically, Mamma Chia. Mamma Chia’s delicious snacks and beverages are loaded with nutrients and easy to take on the run. 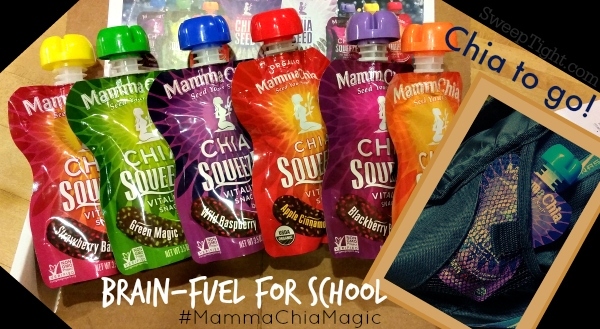 This review and giveaway was made possible by Double Duty Divas and Mamma Chia. I was compensated for my participation in this campaign, but all opinions are 100% mine. Adam, (13 – 8th grade) and Chesney, (9 – 4th grade) both need all the brain fuel they can get. Oh, and so do I. I am taking 7 classes this semester. It’s an absolute nightmare of chaos, stress, and physical/mental fatigue. We need healthy snacks that double as treats to fuel our bodies and mental state of teetering sanity. (Yes, we all respond well to treats. :)) With the new common core standards presenting new challenges for the kids and my completely insane schedule, we need all the help we can get. The Chia Squeeze Vitality Snacks are freaking delicious. We all love them when they’re super cold–almost freezing. Each flavor is super yummy and I honestly cannot pick a favorite. Ches couldn’t either but when I put her on the spot she said the Coconut Mango would be her favorite today. I love these pouches because they are so easy to throw into our backpacks. But sometimes I really just want more. 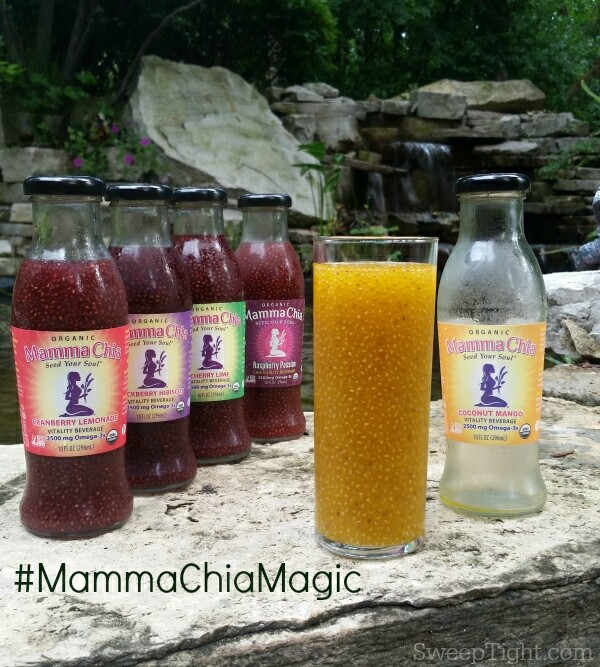 So I am now taking the Mamma Chia Vitality Beverages–they come in a pretty glass bottle–with me to school. I got mine at Jewel, but you can find a retailer new you here. We all love Mamma Chia products. The texture is a bit odd, but the flavor is delicious. I especially love it if I have a sore or scratchy throat. I think it is super soothing. I had my 81 year grandma try it today and even she–a total texture freak–liked it. I was thrilled to see her get some valuable anti-inflammatory Omega-3s in her diet. She has horrendous arthritis and issues with swelling all over her body so this is the perfect snack for her. Here’s a cocktail recipe using Mamma Chia for the adults! 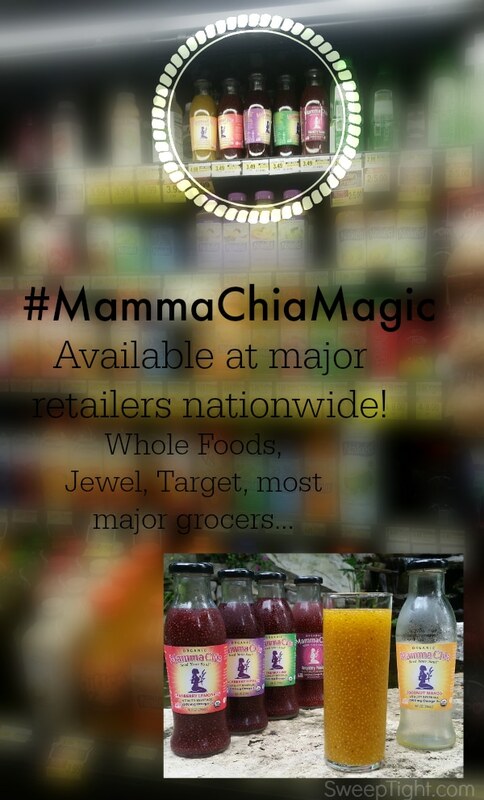 Follow Mamma Chia on Facebook and Twitter to keep up with all the latest news! Thank you for having this great giveaway. I would love to try the blackberry hibiscus vitality beverage. I think the Raspberry Passion sounds the best. I have wondered how the chia drinks taste. I really like chia, just haven’t had in drink form before. I think the Raspberry Passion flavor sounds good. The Mango Coconut is the flavor of Mamma Chia Squeeze that sounds best to me. I would love to try the Raspberry Passion. I really want to try the Blackberry Bliss Chia Squeeze. I would love to try the Strawberry-Lemonade Vitality Beverage. I would like to try the Coconut Mango flavored Mamma Chia Vitality Beverage. The flavor that sounds the best to me is the Strawberry Lemonade. The reason is sounds so good to me is that drinking is will bring back that ol’ summertime feeling and the lemons combined with the strawberries sounds like the best way to quench my thirst. Not mention the that I think my taste buds will fall in love. I can’t wait to try the Strawberry Banana Chia Squeeze – Yum! The Raspberry Passion sounds very good. I would love to give the Raspberry Passion a try! I would love to try the Blackberry Bliss! I love that there is no caffeine in this! Sounds like it would be perfect to drink while I’m nursing and can’t have much caffeine! The Wild Rasberry sounds amazing!!!! The Cranberry Lemonade Vitality Drink sounds so good and refreshing. i WOULD LOVE TO TRY THE RASPBERRY PASSION! Wild Raspberry flavor sounds delicious. I would love to try this. It seems like a source of good clean energy. in love it. Very good for me and one of my girls love it.